Tentacruel in game: 809 Who? Important notice! Pokemon Tentacruel is a fictional character of humans. 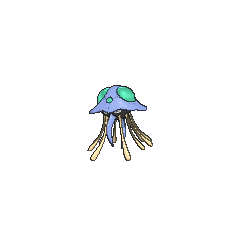 Tentacruel is a large, primarily blue jellyfish-like Pokémon. It has two large, red crystal spheres encrusted in its upper body that can refract sunlight and store energy. The round lower body, from which Tentacruel’s eyes are visible, appears black. It can extend up to 80 tentacles out of its body. Most of these tentacles are hidden, leaving up to 14 exposed. It has two blue beak-like appendages. 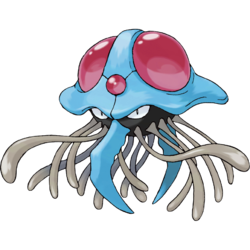 Tentacruel’s tentacles can be freely elongated and shortened, and can absorb water to stretch to some length. The tentacles are normally kept short, but on hunts, they are extended to ensnare and immobilize prey. It weakens the prey by dosing it with a harsh toxin. Its red orbs glow when it grows excited or agitated, and it may alert others to danger by stridently flashing them. Tentacruel can be found throughout the ocean. A giant Tentacruel attacks the city of Porta Vista in the once banned episode Tentacool & Tentacruel. In Mewtwo Strikes Back, a Tentacruel owned by Fergus was one of the Pokémon that were captured and cloned by Mewtwo. The Tentacruel clone is seen again in Mewtwo Returns. Multiple Tentacruel appeared in Viva Las Lapras, under the ownership of the pirate Captain Crook. A Tentacruel owned by Captain Marius appeared in Around the Whirlpool where it got the gang out of the water using its tentacles. In the same episode, a Tentacruel was among the Pokémon stolen from the Pokémon Center of Blue Point Isle. Cassidy has a Tentacruel that appeared in The Search for the Legend. 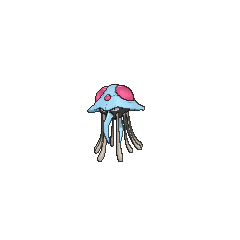 Multiple Tentacruel appeared in The Brockster Is In!. A Tentacruel appeared in a fantasy in Who Gets to Keep Togepi?. A Tentacruel belonging to a Trainer competing in the Indigo Plateau Conference appeared in Round One - Begin!. Marina owns a Tentacruel in Bye Bye Psyduck. Tentacruel appeared in a fantasy in Charizard Chills. Multiple Tentacruel also appeared in The Power of One, Kalos, Where Dreams and Adventures Begin! and Diancie and the Cocoon of Destruction. Two Tentacruel appeared in The Joy of Water Pokémon. One was living in Lake Lucid, while the other one was receiving special treatment in a salt bath tank in the Pokémon Center near the lake. A Tentacruel appeared in Dueling Heroes. Each of the Invincible Pokémon Brothers in Cerulean Blues has a Tentacruel. Lola owns a Tentacruel as seen in A Family That Battles Together Stays Together!. 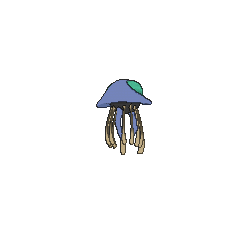 Juan has several Tentacruel that appeared in The Great Eight Fate!. Another Tentacruel appeared in the opening of Lucario and the Mystery of Mew and Zoroark: Master of Illusions. A Tentacruel appeared in SM005, during a fantasy. Wild Tentacruel were first seen in Wake Up--You’re Snorlax! as obstacles for the racers. In The Kindest Tentacruel a herd of Tentacool appeared along with a Tentacruel where a baby Tentacool got its tentacle stuck under a boulder where it later helped rescue Yellow and later threw the Pokémon Fan Club Chairman out of the ocean. Later, it is seen in the possession of various villains such as Koga of the Team Rocket triad and Archie of Team Aqua, as well as his Emerald chapter guise, Guile Hideout. 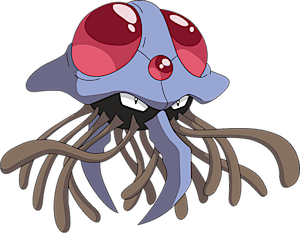 Tentacruel has large red orbs on its head. The orbs glow before lashing the vicinity with a harsh ultrasonic blast. This Pokémon's outburst composes rough waves around it. Tentacruel may take inspiration from the jellyfish and the Portuguese man o' war. It also shares some characteristics of squid.